I just bought the Life Source product and found out it is a mud. Can someone indicate to me how to use this product? Should I broadcast the product in front of a pump blowing it all over the tank and on my rocks and corals? Or should I gently deposit a little of it at the bottom of the tank in an area of high flow so it is not defused everywhere in the tank? According to the directions it appears this is broadcast in an area of high flow @ 10ml/100L or 27 US Gallons. It also says that it will make the water cloudy and this is normal. Love the "100% natural deposit derived from the cleanest water of the Pacific" sentence. One of the reasons I've drop AF was because I couldn't understand what things are and how they work. Please don't get me wrong but when you ask for help you get a pic from the website... which it's in line the AF customer information approach. Difficult to understand it's how you bought a product without knowing how to use it. I find nothing hard to understand here. I knew it was a mud and I want to use it for the added minerals since I use cheap Instant Ocean and feel my thriving tank could use the extra minerals. It's just that the instructions say to add in a high flow area. That could be understood to mean to broadcast at large near a pump but it could also mean to deposit at the bottom where there is high flow reaching the mud. I like AF products but I am annoyed with the information given to us about them. I would be looking forward to using this stuff but I have no idea what it does. The advertisement is the only thing to go by and it leaves things kind of open to interpretation I guess. What minerals? What components? How does it act as a buffer for microbiology? Why is it great with a dsb or algae refugium? Is it increasing phosphates or nitrates in anyway? Is it basically a food for the smaller creatures in our tanks??? Seriously answering at least a few of these questions might make me try it but til then I wouldn't know why I need it. The wording in the add sounds so cool I am sure it's getting people to buy it but how would they even know it's helping their tanks? I will look into it . I myself am not familiar with this product yet but I will get you an answer. You might have to give me a couple of days due to the holiday. Thanks! I hope they give some details. Thank you. Looking forward to your answer. Meanwhile, I will use my first 10 ml on my 25 gallon tank tonight. I will let you know if I notice any difference in my tank over the next weeks and months. A nice Easter surprise. I've got some answers for you. In the future I will provide more answers as they become available. 1. As pertaining to when this will be available. There is no set date at this time and it is currently in the hands of the distributor. I will have further info on this soon. My personal thoughts.... it will probably be several weeks yet. Af life source is mud from the pacific waters near Fiji. It contains natural bacterium and trace elements from the ocean. It is made to dose that directly to tank but not specifically to corals. It's good to put spoon near return pump to let the mud to spread out to the entire system. Why for Balling system? Balling is for dose macro- Ca,KH, Mg and micro. This is mud is to support BIOLOGY, not chemistry. The reef tank . You have many, millions of micro life, bacteria, mysis, wild tubes sponges etc in sump. This if for supporting the biology balance, and specifically for micro life . This really helps in a big way with stability. 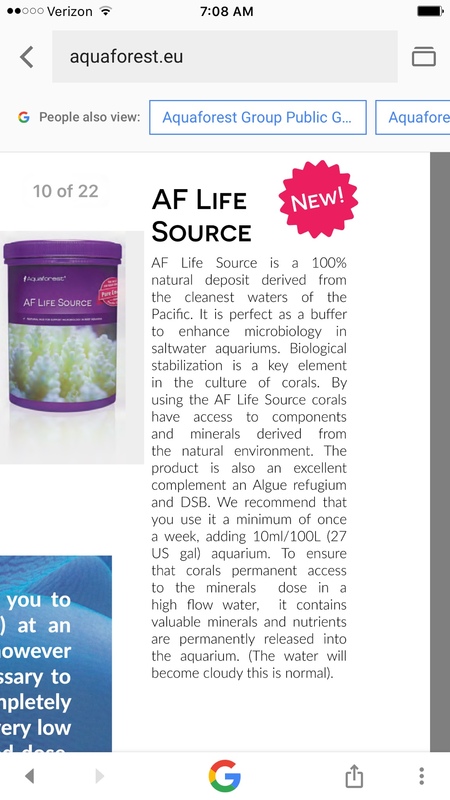 This is an awesome way to FEED a dsb and refugium because in that area there is a lot of microbial life and AF LIFE SOURCE is great for supporting all of it. I did not drop the mud in one shot in front of a pump as the test clump fell undissolved on a coral below. I rather lowered the spoon under water in front of the pump and used my finger to swirl the mud inside the spoon. After about 30 seconds, all the mud was dissolved and my tank water became very cloudy. After an hour, water had clear about 90%. Two hours later, tank water was crystal clear again. No immediate bad ( nor good ) reaction from either corals or fish or other animals. I used about 7 ml in my 25 gallon cube. I have a heavily stocked mixed tank. Thank you 120reefer for your answers although they are more concerned about the objectif of the mud than the science behind it. I will continue to drop mud once a week in my tank and let you know if I witness any reactions good or bad. Last edited by Sawen; 04/17/2017 at 06:10 AM. It's your opinion and it's quite good you're allowed to have it here. Im up to my third dose. I've decided to mix it in a glass filled with tank water before broadcasting it in front of a Tunze pump. My intent on this page as well as AF intent is to help. I apologize if I came off wrong, but I have seen previous users derail good threads, say derogatory things on AF users personal journals, and it takes away from the goal or intent. Please reach me personally if you ever do decide to give AF another try, I will do my best to guide you to success. Cheers my friend! Thanks! For sure I'll take your gentle offer when time come. Hi guys any more info or experiences with this product ye now its been out a while. This is one product in the line up i am not as sure its purpose as the others. So what are people seeing from its use or should be expected to see. I have been having what i think is a dino problem in my tank. I think recently its been turning around but was wondering, as one of the plans of attack in dino is increase biodiversity in the tank to outcompete the dino, if this product could help with that if its feeding or increasing that micro life? This is screenshot from Polish forum. Translation: I do not know how it works in an existing aquarium, but I used this "mud" to my new, fully synthetic system to support the development of microlife. Today my sump if full of mysis and other micro life and looks like below. Last edited by Aquaforest; 09/29/2017 at 07:00 AM. I started this thread last April. I have been adding between 5 and 10 ml of this mud once every Friday night into my 25 gallon cube. I have a mixed tank, about half LPS and half SPS, and some Ricordias and some orange clove polyps as well. My tank is 8 years old. My tank was looking good before I started adding the mud and it is still looking good today. Uncertain. Because I started using other AF products around the same time, it is impossible to pin down what did what. But here are the changes I have observed in my tank since April. More sponges and tunicates. My large snails have started reproducing at an incredible rate. And they grow to an adult age. More worms. Many small glass cleaning nudibranches have appeared. All this because of the mud? Impossible to tell. Will I keep on using the mud? Yes. Will I buy another jar when this one is over? I might wait a couple of months just to see if I see a decrease in fauna. But yes I might. So if this does help feed and increase populations of micro life and micro fauno it may be beneficial in the fightagainst dino. I have also noticed an explosion of Coralline algae on the glass walls. Im not sure it has anything to do with this product however. I thought I would mention it because someone else mentionned it as well on another board. I've noticed still more little unknown creatures in my tank in the last few days. I went from 5-10 ml a week to about 5 ml about two weeks ago. Five ml a week in a 25 gallon cube seems good enough for me. I am also bare botttom. Do you find this product settles one the bottom? or does the product disolve into the water column? Ecosystems mud doesn't dissolve as i understand, is this product comparable to that? If you mix the life source with a sufficient amount of tank water first, then pour it back into the tank. Mix it really well and you will have no settling. Some of it winds up in my protein skimmer. Some is caught by my filtration media....in my floss for example. When I use a turkey blaster on my rocks, some does get blown away. Some of my corals might catch some too as I have observed this stuff sends many of them into feeding mode. I have no clue how much dissolves into the water but tank is clear after about three hours.